A couple of years ago a good friend of mine gave me an electric takoyaki maker for my birthday. Takoyaki literally translated means octopus fried, but takoyaki isn’t just fried octopus – it’s a tiny, piping hot ball of batter filled with green onions, ginger, crispy tempura bits and octopus. It’s crisp, it’s gooey, it’s delicious. 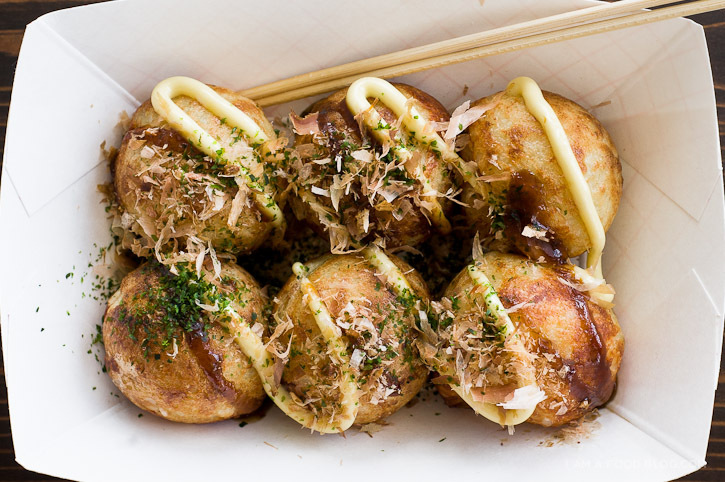 Takoyaki is one of Osaka’s quintessential street foods. Thankfully for us, you don’t have to travel to Osaka for takoyaki – they’re basically found everywhere in Japan and are quite popular in North America too. If you ever come across a takoyaki stand stay awhile and check out the takoyaki makers. They’re mesmerizing. 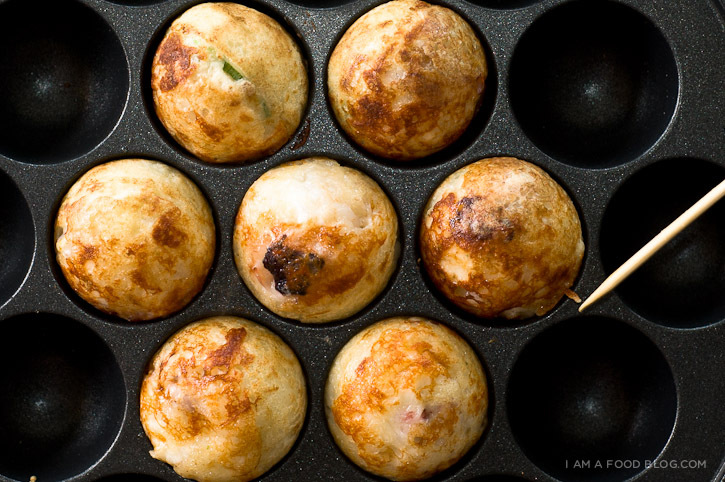 Professional takoyaki makers have rows and rows of cast iron pans with half spherical molds. A dashi flavoured batter is poured into the molds and then each ball gets a piece of octopus, some ginger, and green onions. When the bottom of the balls are cooked, they’re flipped with skewers so that the inside batter flows out to create the other side of the ball. 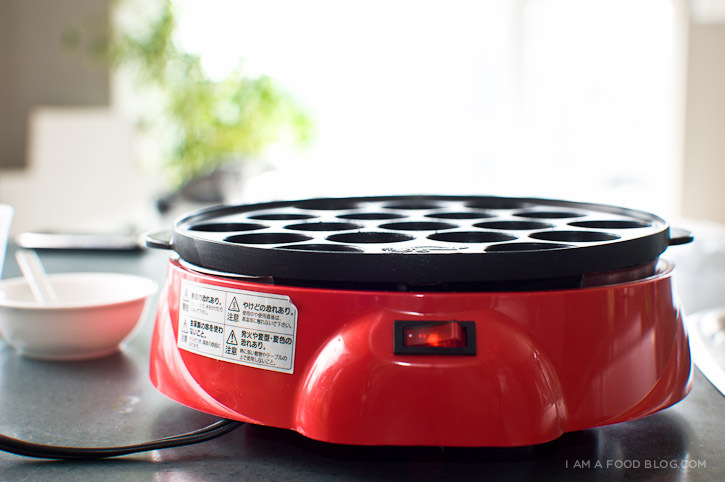 It’s amazing to watch a real takoyaki maker. They’re fast, furious and churn out the little balls like there’s no tomorrow. I’m no takoyaki master, but I sure do like the zen feeling that comes over me while I try to make perfectly spherical takoyaki. I’ve only ever used my pan once so when my friend wanted to bring over her takoyaki pan and have a takoyaki party I was pretty excited. I even wanted to have a takoyaki off with one of my Japanese friends but he declined, saying it wasn’t a fair contest as I would no doubt win. Non-contest aside, we had a great time making individualized takoyakis. Everyone thought they tasted just like the takoyaki vendors. Takoyaki need quite a few ingredients and a specialized pan, but I think it’s worth it. 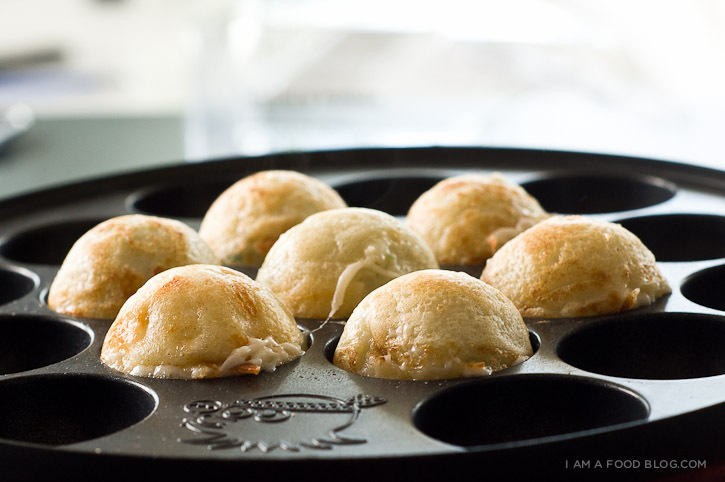 You can find a takoyaki pan on amazon.com or you can use an ebelskiver (Danish pancake) pan. As for the insides, octopus is classic, but feel free to put in shrimp, chicken, or whatever savoury filling you like. I like to do a combo of octopus, squid and shrimp. I also throw in some mozzarella cheese to get an crispy toasted cheese outside with an extra gooey cheesy inside. If you’ve never seen takoyaki being made, do a youtube search, it’ll give a good starting point for how to flip the little balls around. i am octopus-filled, i am balled: i am takoyaki! Beat the eggs and add the water, and stock granules. Add the egg-water mixture to the flour and salt and mix well. Heat up your pan and oil the individual compartments with a oil brush or use a paper towel dipped in oil. Pour the batter into the individual compartments up to the top. Don’t worry if the batter over flows a bit. Add green onions, your protein, tempura bits or rice krispies, and shredded cheese (is using). After a while, the bottom of the takoyakis will be cooked through. At this point, you can use a skewer to turn them over 90 degrees. If you can’t turn the takoyaki easily, it probably needs to cook for a bit longer. Wait a minute or so and then do another 90 degree turn. The balls will become easier to turn the more they cook. The takoyaki are done when they’re lightly brown and crispy on the outside and they turn easily in their holes. Overall I’d say it takes about 10 minutes per batch, from start to finish. 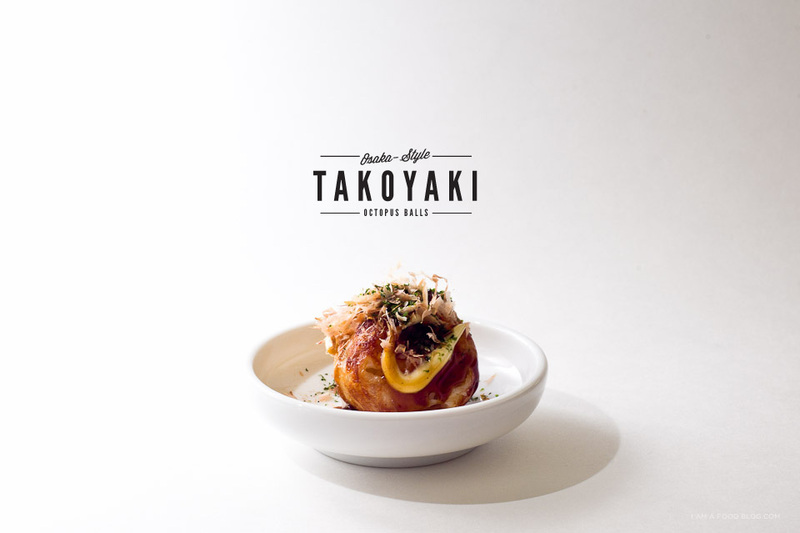 To serve, place the takoyaki on a plate and drizzle with Japanese mayonnaise and takoyaki sauce. Genrously sprinkle on the bonito flakes and aonori. Enjoy, but be careful, the insides are hot! *If you’re feeling lazy, just go ahead and buy the prepackaged takoyaki flour at an Asian supermarket. All you need to do is add water and eggs. Never had octopus, but if anything will convince me to try it, it’s frying. Wow, that last shot looks like a professionally made takoyaki maker plated it up! ;-) So nice you can make these for yourself at home. I have to wait for the street fairs in Japantown! It looks exactly like the ones we ordered at the restaurant! Yum! Asolutely gorgeous!! First time here. Love it. When we lived in the Philippines (such a long time ago), we usually vacationed in Japan…Japanese street food is one of my faves, and it doesn’t cease to excite me! Takoyaki is one of the snacks I remember having! So yummy! And that machine is just so cute! The Japanese really have spmething for evertything! Hehehe…Did I already tell you that I love your blog?!!!! Now I feel like I must have them…Have you visited Gindako? They lightly fry by pouring small amount of oil with the squeezer on top of them and it is the best thing on this planet…<3 they have many different kinds of mayonase too! I’ve been so inspired by your photographic style and blog layout ever since I started silently reading your blog months ago. I always wondered where you got your beautiful fonts from? Just got my takoyaki pan today and tried out your recipe, it is the absolute BOMB! <3 Love it so much!! Thank you!! Love your blog on takoyaki. Where did you buy takoyaki machine? I love takoyaki, and have been desperately trying to justify fitting such a specialist piece of equipment into my tiny kitchen. Totally impractical, but I may well fold soon and purchase! Think I’ll keep it traditional with octopus, however – hot dogs and cheese seem anathema to me! Plus, then they’d have to be called hotdogyaki or cheeseyaki!! You can make (small) Danish aebleskiver, and Dutch Poffertjes in it too. And you don’t need to buy a machine, there is pans too! Great post, I’ve eaten these before but didn’t know how they were made. Really interesting to see, thanks for sharing. Where do you find the dashi stock granules? Is this similar to the instant hon dashi you can find? Its a very nice post you share with us. It looks delicious, I will defiantly try it. Great recipe. I have tried it today and it worked perfectly. Thank you for sharing it. It was a delight. I will try some of your other recipes in the near time. Takoyaki is a favorite. The way they are flipped over one by one is hypnotic! I have tried squid filling instead of octopus. I love your idea of adding cheese. Sounds pretty yum yum yum! I know it’s quite absurd to ask but COULD YOU TELL ME WHERE U GOT ALL THESE AMAZING FONTS? And if you made them yourselves, will you let me have some ? hi, any idea where to buy the maker in singapore? You mention that the Takoyaki cookers are available on amazon.com .I have checked and yes there are lots for sale , most seem to come directly from Japan and shipped , my big question is the voltage is not compatable with ours ,I was told by a vendor in Toronto that they don’t meet North American standards.How did your machine work or what did you have to do to make it work on our voltage ? i LOVE takoyaki and had it all the time in Shanghai (i know, not Osaka, but delicious nonetheless). I’ve tried, unsuccessfully to find it in Boston but have had no success. Maybe this recipe will have to do for now. Thank you for sharing! World has infinitive dishes but takoyaki can beat most of it , I visit japan very often and takoyaki is their to serve me right after sashimi. I spend some of my time watching at chefs turning the takoyaki balls at incredible speed to serve dozens of people in the queue. In fact I bought that pan from japan and tried it but I think , I need to attend school in japan to learn make takoyaki for not less than 2years. But amazing , yummy and delicious. Yummm. I don’t even know where to begin to find these ingredients, but I have an ebelskiver pan (close enough) and I love takoyaki so I’m going to give this a try! Question: Roughly how much octopus did you use? 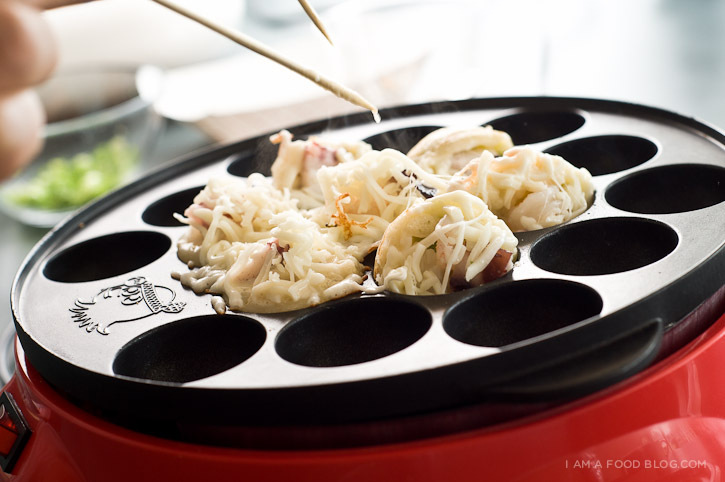 i m gonna try this takoyaki grill pan tonight,wish me luck!! Discovered a cake-pop maker does a wonderful job at Takoyaki! Might be a little bigger than tradional, but does the trick! Made the kids some omelet-Yaki this morning…yum. Scrambled eggs with whatever filling you want. How has that Takoyaki pan been working for you? I saw it on Amazon and it got mixed reviews.. just curious how its been for you. You can usually find takoyaki sauce and dashi at Asian food stores. Hope that helps! Where can i buy this tako pan. Can i buy it online? Yes, they sell them on amazon. I tried it but failed. My batter stuck to the pan. I used a CAst iron pan I bought from an orientsl store. What did I do wrong? It’s possible that you aren’t using enough oil or that you’re trying to turn them before they have a chance to firm up. Wow, I am really impressed. Tried this ones in Tokyo during a party night and have immediatley the taste in my mouth when I saw your pictures! For Angela and the cast iron pan: the pan needs to be seasoned as you would any other cast iron Dutch oven or fry pan. You’ve got some really great recipes and photos to match..will definitely be trying a few of these. This is so darn beautiful and I’m so dang into it.